DaVinci Piaffe Horse As A Tattoo!! Well, this is a new one! My DaVinci Piaffe horse as a tattoo - a big one at that! Far braver than I....never thought I'd see the day. Thank you to the collector! Aren't horses amazing? Click HERE to purchase! The best prices offered annually. "Catherine Twomey sold a 10.000" x 10.000" print of The Horse's Canter Revealed to a buyer from Pomfret Center, CT."
Annual Equestrian Print Sale in on Now! TODAY ONLY! Free Shipping on Fine Art America ANYWHERE! TODAY ONLY!!! An incredible DEAL! Free Shipping TODAY on Fine Art America! STUDIO SALE ONCE A YEAR ONLY!!! Eight different equine/horse prints! "The DaVinci Horse's Canter Revealed"
Donating Instead of Gifting: A Great Idea! This year, instead of giving each other things we no longer need or want, my family has decided to donate to causes we believe in. Good causes, every one of them. And a huge thank you to those who have purchased my art so I could donate to Hopes Legacy Equine Rescue. It's nice to feel optimistic again about the world. "Hope's Legacy Equine Rescue" Print Sale Fundraising! Having now sold seven prints from "The Horse's Gaits Revealed" series, I will donate sale proceeds from now until Dec. 25 to Hope's Legacy Equine Rescue, Inc. (www.hopeslegacy.com). to purchase prints in a variety of sizes and combinations. Print sold last night on saatchiart.com, "WTC: Walk, Trot and Canter, The Horse's Gaits Revealed" by C. Twomey ©2016. These completely original, heavily researched and professionally created images are on sale now. You will not find a more creative and beautiful gift for the horse lover in your life. DaVinci Walk, Trot, Canter and Piaffe Equine Images. These award-winning horse images are from the series by C. Twomey, renowned internationally recognized illustrator featuring accurate and beautifully executed images that will bring joy to every recipient. 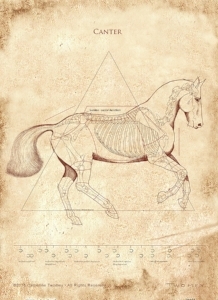 "Commissioned for the cover of the "United States Dressage Federation" magazine Connections, it was inspired by "The Vitruvian Man" by Leaonardo da Vinci circa 1487. 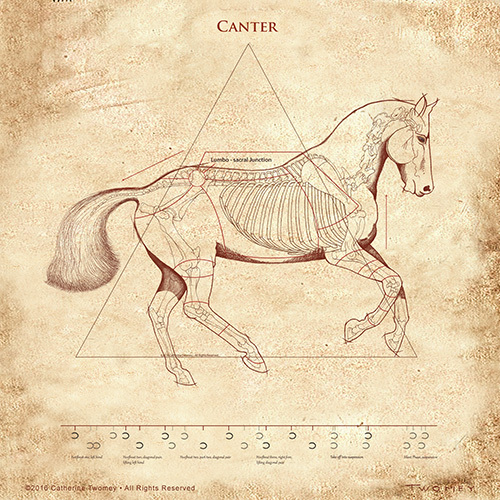 This could be considered the "Canon of Proportions" for the horse performing the dressage movement piaffe. 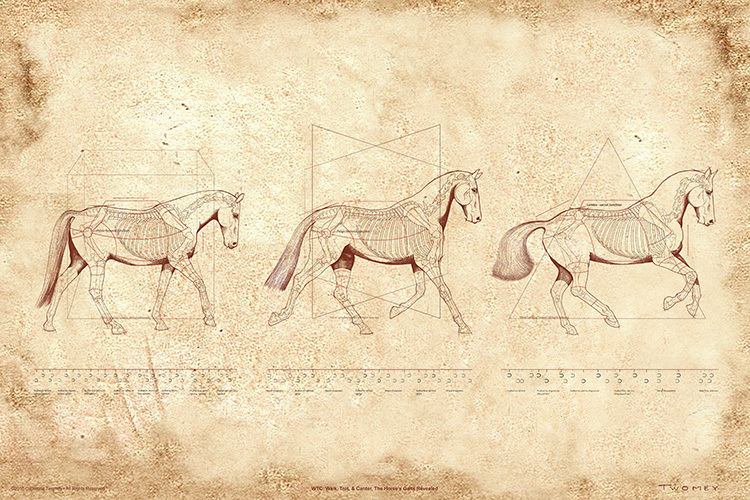 It is based on the correlations of ideal horse proportions with geometry. It exemplifies the blend of art and science during the Renaissance. Winning painting/illustration of the American Horse Publications Annual Awards, First Place in Illustration for "Da Vinci Horse", 2007. 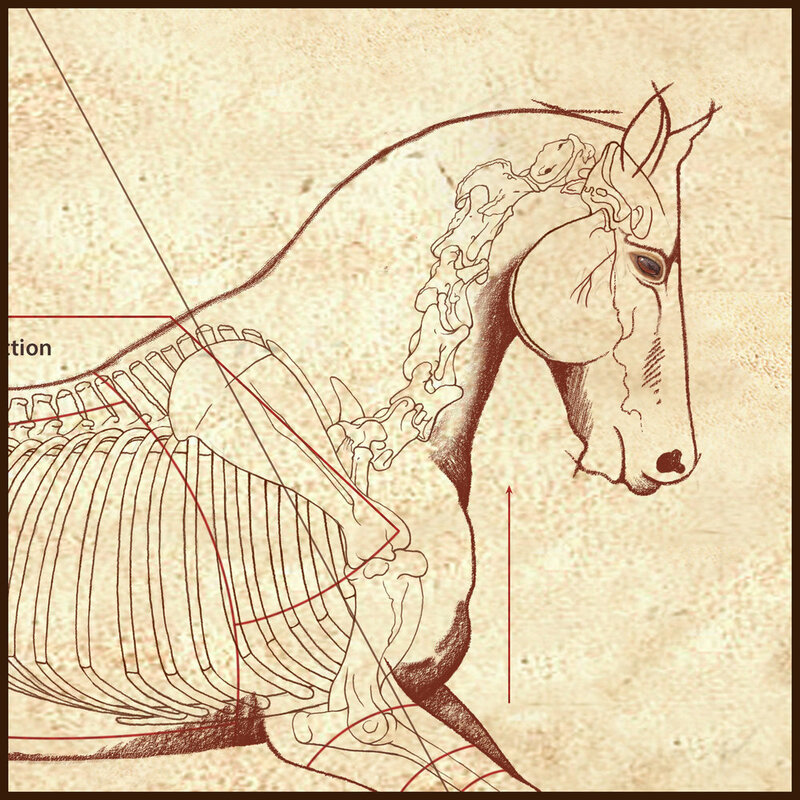 This print shows an anatomically accurate transparent horse and skeleton."